What is your favorite comfort food? I always think about comfort foods in the fall and most of my comfort foods have something to do with cheese. Mac and Cheese, pizza, Alfredo pasta and the list goes on. I guess I am pretty crazy about cheese. I’ve also raised my kids to love it too! 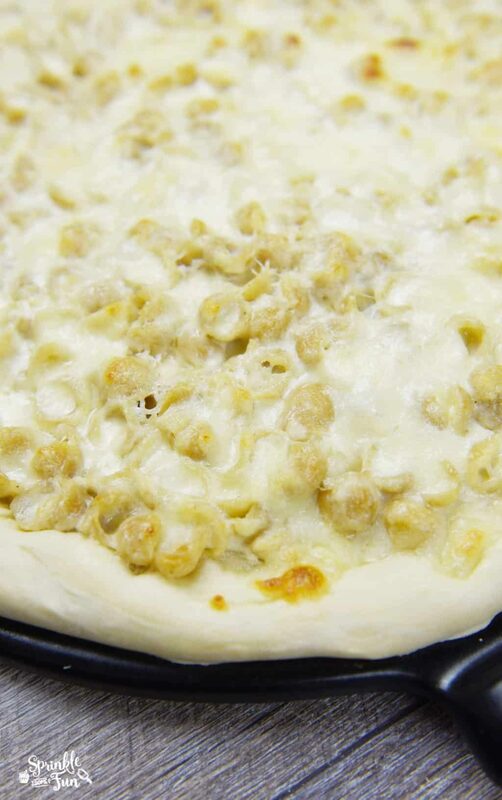 So the other day I made up this easy Alfredo Mac & Cheese Pizza and it was simply amazing. 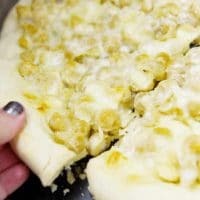 I’ve had the Mac & Cheese pizzas before and so I wanted to change it up a little bit with Alfredo sauce that’s made with a simple box of Annie’s Homegrown Organic Mac and Cheese. Watch the Annie’s Homegrown Youtube video here! 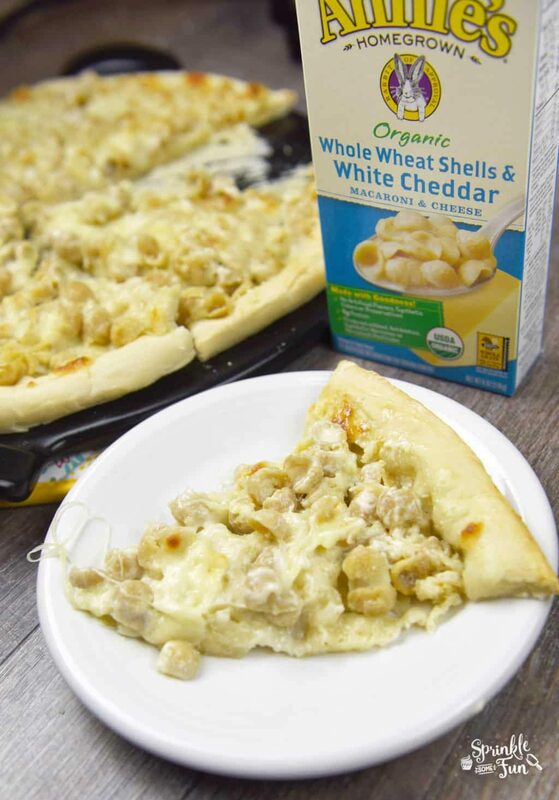 We love the Annie’s Homegrown Organic Mac and Cheese in the Whole Wheat Shells and white cheddar already and I knew it would be perfect for this pizza. If you like cheese then this is the perfect Mac and Cheese for you, too! It’s also certified organic which helps me on my mission to eat better and live more responsibly. I’m glad that I don’t have to give up taste to eat certified organic foods. Finding Annie’s is as easy as heading to your local grocery store! The pizza baked up perfectly and was ready in just 30 minutes if you count from start to finish. 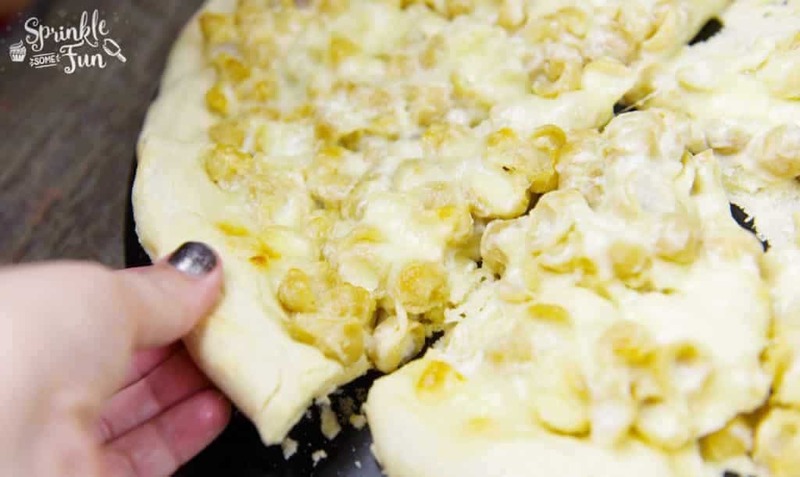 I used a frozen dough that I thawed out to make this, but you can use your favorite recipe for pizza dough too. Preheat oven to 475 degrees F. Spread pizza dough on pizza pan. Boil the Annie's Mac and Cheese shells according to the package and drain. Return to the pan on low heat and mix in butter first until melted. Then add the cheese packet, heavy cream, garlic and 1 cup of the parmesan cheese. Mix thoroughly. Turn off heat. 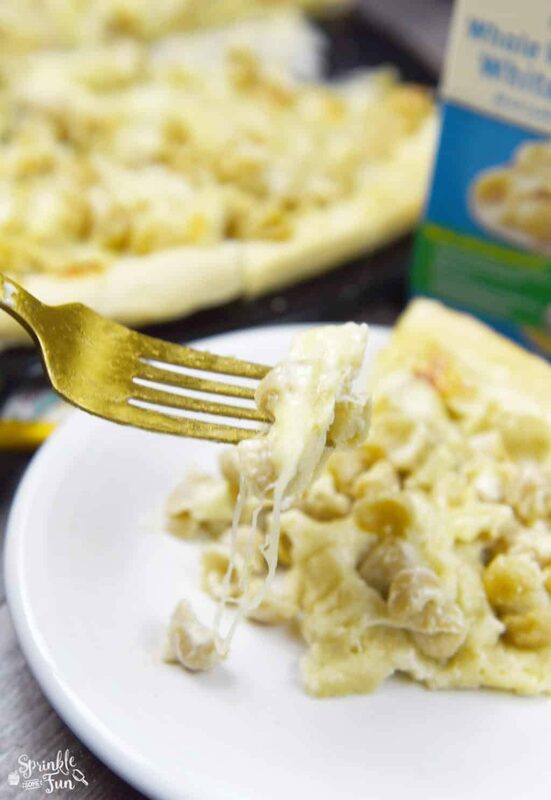 Spoon mixture onto the pizza dough and sprinkle the mozzarella and rest of parmesan cheese on top. Bake at 475 for 15 minutes or until cheese is bubbly and crust is golden brown. That first bite full of cheese, noodles and bread goodness is so amazing! We will definitely be making this meal again and again. I love how versatile the Annie’s Homegrown Organic Mac and Cheese really is and this recipe is just the beginning. Add veggies and other ingredients to make your Annie’s Homegrown Organic Mac and Cheese different for every meal! If you have never heard of Annie’s before you might want to know that Annie’s is a mission-driven business grounded in using natural and organic ingredients to make great-tasting products that consumers love. They source ingredients only from places and people they trust. This makes them a positive role model and a business that I love to support!